Enter our QUILTsocial free giveaway contest this week for your chance to win a set of WonderFIl Specialty Threads Spotlite Metallic Threads. 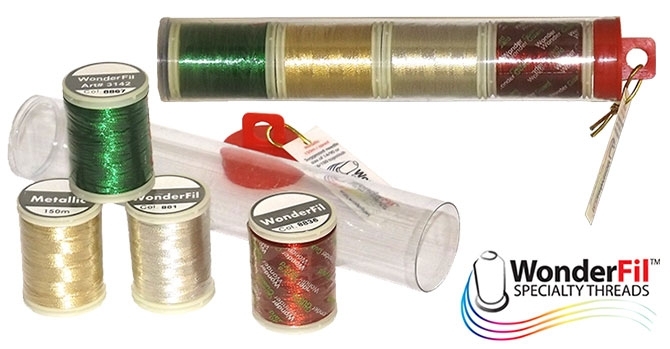 Spotlite: 40wt Metallic thread that is rayon based, not wiry, smooth running and soft to the touch. Runs at up to 800 spm with domestic & embroidery machines. 1093yd (100m) spools. Available in 40 colors. Applications: Machine embroidery, quilting, decorative stitches, hand needlework, thread painting, couching other threads and fibers. Contest ends Tuesday December 2nd at 9AM. Go to the entry form below and get your entries in now! Congratulations to Marion B, winner of last week’s draw for a free Lunch Box Quilts – Picnic Time (with CD) applique designs for embroidery machines, sponsored by PFAFF Canada! I love metallic threads but haven’t had much success with using them. Any suggestions would be a help.